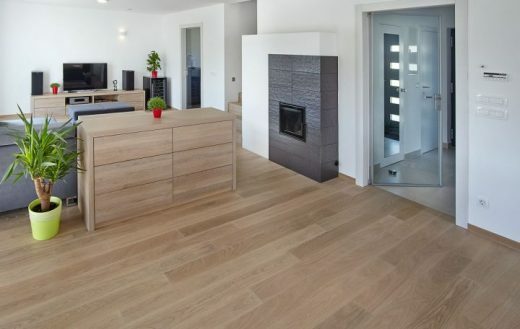 Parquet flooring installation is a rather difficult process, which demands an expert or at least somebody skilled enough. So the easiest way is to hire a professional parquet flooring company or an expert, who knows how to install parquet wood flooring, has a lot of experiences and can lay the parquet in the desired pattern (such as herringbone parquet flooring etc.). If, however, we want to execute the parquet flooring installation ourselves, we offer some information on the preparation of the subfloor. If we want a really long-lasting result, we also need to know how to protect parquet flooring and how to care for parquet flooring (but more on that in some other article). Before we begin with the parquet flooring installation, we need to prepare the subfloor. New plywood requires no preparation. With wooden subfloors we need to make sure there are no squeaks (insert screws into the underlying floor joists, and then walk over it and make sure the floor is not moving. If it is, add a couple of more screws). Than we need to wash it and make sure it’s completely level (apply leveller). Let it dry. If the parquet flooring installation will be performed over concrete, we must remove any dirt, oil or grease and perform moisture test (put plastic sheets over the floor and secure them with duct tape. Than wait 24-48 hours and see if there is any condensation. If it is, the subfloor is not appropriate for parquet flooring installation, but you can cover it with plywood). We can also decide for a parquet flooring installation over tiles, for example, which need to be clean and level (apply latex bonding agent and leveller), any broken or loose tiles need to be removed. You can also do the moisture test prior to the parquet flooring installation. basket wave parquet flooring installation method. Herringbone parquet flooring and other mentioned patterns are always fashionable and subtle enough, so that we won’t get tired of it. If, however, you want something more extravagant, you can choose from many other possible patterns, just make sure that you hire somebody skilled in the art of parquet flooring installation.